Here you will find the notification center at Miss Utility, information about resource sharing, and an application to obtain a utility permit. The Utility Center explains how to work with electricity, telecommunications, gas, water and sewer lines on Maryland highways. Miss Utility is a one-call notification center that notifies subscribing underground facility owner-members about proposed excavation. Use the documents below to accommodate, construct, adjust, relocate, and maintain utilities within MDOT SHA’s rights of way. 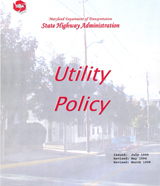 MDOT SHA Utility Policy (PDF, 601kb) A comprehensive guide to utility accommodation and utility construction. MDOT SHA Utility Procedures Manual (PDF, 720 kb) Detailing the processes for utility coordination, construction, billing, and third-party work. 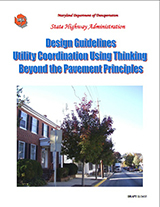 Design Guidelines - Utility Coordination Using Thinking Beyond the Pavement Principles (PDF, 8.74 MB) Guidelines for utility engineers, project design engineers and consultants when designing streetscapes and urban revitalization. 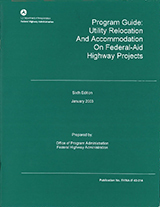 FHWA Program Guide (FAPG): Utility Relocation and Accommodation On Federal-Aid Projects (PDF, 147 kb) A guide developed by the Federal Highway Administration (FHWA) for those administering federal-aid highway programs that use federal funds for the relocation and adjustment of utility facilities, as well as the accommodation of utility facilities and private lines on federal-aid highway rights of way. 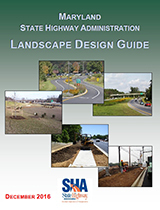 MDOT SHA Landscape Design Guide (PDF, 1.55 MB) Policies and design principles for landscape construction, including standards for landscape plans, mitigation design, and offset distances.